I. Blood tests: The blood count and ESR is normal. II. Synovial fluid analysis: It shows mild increase in white blood cells. This test can be useful in differentiating osteoarthritis from gout, infective arthritis. Osteophytes are seen as dense area at the end of the bones in the affected joints. Small bony outgrowths (spur) are seen at the edges of the bones. “Bone cysts” may also be seen. IV. 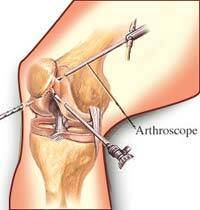 Arthroscopy i.e. inspection of interior of joint by means of an instrument called arthroscope. V. Radioisotope scanning shows increased uptake of isotope in involved joints.